The 4 C's of Carat refers to the diamond's weight. Diamond weight is measured in Carats, a small unit of measurement equal to 200 milligrams. Each carat is divided into 100 points. Therefore, a half-carat stone may be referred to as a "50-pointer" or "50-points." Carat weight is the easiest of the 4 C's for gemologists to determine because of the use of sophisticated measuring equipment. But diamond weight doesn't always translate into the physical size of the diamond. And that is a very important difference. Two diamonds of equal carat weight might vary greatly in value depending upon their physical size, among other factors. This is important because when mounted, one diamond may appear larger than the other, although they actually weigh the same. And that may significantly impact the value of the diamond. Diamonds are sold by carat weight. In the diamond trade, price is given in price per carat and not in total dollars. For example a 1.02ct diamond that costs $2,000 per carat would cost 1.02 X $2,000 = $2,040. The proper size dimension of a diamond for its weight is an extremely crucial element in its value and desirability. For example, a 1.00 carat round diamond should measure approximately 6.5mm in diameter, a 1.50ct should measure around 7.5mm, a 2.00ct should measure around 8.1-8.2mm, and so on. If you see a diamond listed on line in the 1.00ct size which only measures 6.2-6.3mm (or smaller), you should not buy it! That diamond doesn't look any larger than a well cut 0.80-0.90ct diamond. This also applies to 1.50ct diamonds which measure 7.2 or 7.3mm. These diamonds may have a good grade on paper, even a terrific cut grade and a "great price" but it is not a diamond I would ever recommend to my private customer. 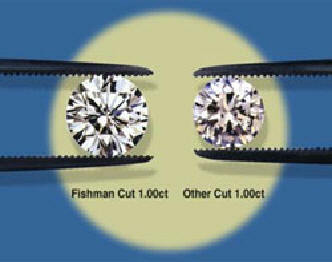 See more about how to measure carat size from A. Fishman & Son Cut Diamond. The same factor applies to fancy shaped diamonds with the additional requirement that the diamond's shape has to be right, not just its dimensions. Here is a photo of two diamonds which both weigh 1.00cts. This is from a real case where a customer of ours was about to buy a diamond which he thought was a "great deal" for its Certificate Grade. That diamond is on the right. I took this photo of his "almost" purchase versus the diamond of ours on the left, which had the same weight and Certificate Grade, which he ended up buying. A picture is worth a thousand words.